Due to overwhelming demand this centerpiece is sold out. Please consider the Pomegranate Centerpiece as an alternate purchase. This is one centerpiece that knows how to be the center of attention. Placed on a dining room table, a sideboard, or even a breakfast nook in the kitchen, it’s 360-degree design is equally as intriguing from all angles and impresses with an unusual gathering of fall time foliage. Integrifolia, preserved burgundy leaves, natural millet, leaf green myrtle, natural flax, and natural lotus pods create a very full and fanciful bed atop our handmade, brown wooden box. 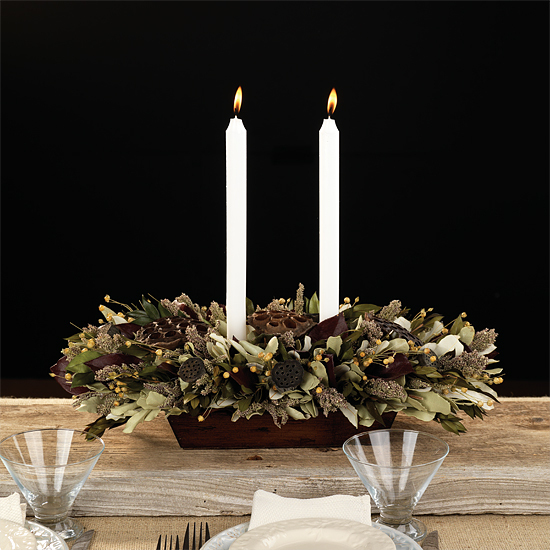 It sets the perfect stage for two white taper candles to cast a warm glow and set a cozy mood. To remove, simply snip wires from the back of the box and lift the item gently. Our preserved designs are originally produced with extra elements so slight shedding during transit is normal. The colors will soften naturally over time. The designs are best maintained when displayed indoors, away from direct sunlight, strong heat sources and extreme moisture. Please note: outdoor display is not recommended. If candles are lit, DO NOT LEAVE centerpiece unattended. When lit, keep away from drafts, vents or air currents. Do not burn candles all the way down. For a margin of safety, discontinue burning candles when 4" of wax remains.